The role of cytokines in fibrinolysis: A case study of active tuberculosis. Citation: Akpan PA, Akpotuzor JO, Osim EE. The role of cytokines in fibrinolysis: A case study of active tuberculosis. J Infectious Disease Med Microbiol. 2017;1(1):1-5. Objective: Active tuberculosis (TB) is a disease arising from infection by the Mycobacterium tuberculosis complex which induces a state of chronic inflammation. The inflammatory response is mediated by the release of cytokines which have the potential to initiate disturbance of the fibrinolytic system. The aim of this study is to assess the role of cytokines in fibrinolysis in a condition of chronic inflammation such as active tuberculosis. Methods: Case-control study design was employed. One hundred and twenty (120) TB patients and 120 apparently healthy subjects aged 15-60 years and gender-matched were recruited for this study. Active tuberculosis was diagnosed by the presence of acid fast bacilli in sputum smear microscopy, X-ray or clinical assessment. Fibrinogen concentration (FIB) was measured by Clauss technique while fibrin degradation product (FDP), interferon gamma (IFN-?) and interleukin 10 (IL-10) were measured by sandwich enzyme immunoassay (ELISA) using standard kits. Data obtained were analysed using Student?s T-test and one-way ANOVA on statistical package for social sciences (SPSS) version 20 software. Pearson?s correlation was used to express relationship and significance was set at P ? 0.05. Results: Results obtained showed significantly higher (P<0.05) fibrinogen concentration, fibrin degradation product, interferon gamma as well as interleukin 10 levels of active TB patients versus control subjects indicating the presence of infection-induced inflammatory response which mediates acute phase reaction as well as increase fibrinolytic activity. Significant positive correlations (P<0.05) were observed between fibrinogen concentration and fibrin degradation product as well as between fibrinogen concentration and interleukin 10 level. Fibrinogen concentration, fibrin degradation product and interleukin 10 levels decreased significantly with progress in anti-tuberculosis therapy hence they could serve as useful indices in monitoring the response of tuberculosis patients to treatment. Conclusion: It is concluded that the cytokines interferon-? and interleukin 10 contribute significantly to increase fibrinolytic activity as seen in active tuberculosis with haemorrhage as possible sequel. Fibrinolysis refers to the enzymatic breakdown of fibrin by the action of plasmin. Initiated at the time of tissue injury, fibrinolysis is a normal haemostatic response to vascular damage; it plays a valuable role in removing fibrin from intravascular and extravascular sites sequel to clot formation. Aberrations of the fibrinolytic response can have catastrophic clinical consequences in terms of both haemorrhagic and thrombotic events . Components of the fibrinolytic system include plasminogen activators which are proteolytic enzymes found in all body fluids as well as in most tissues in trace amounts; they are very specific for plasminogen activation converting plasminogen to plasmin . Intrinsic plasminogen activators are derived from plasma and blood cells whereas tissue-type activators are concentrated in the lysosomal granules and the endothelial cells of blood vessels with urokinase and tissue plasminogen activator (t-PA) being the most expressed . Impaired fibrinolysis involves mechanisms such as dysfunctional plasminogen and decreased plasminogen activator levels in addition to a rise in the levels of fibrinolytic system inhibitors (alpha2-antiplasmin and alpha2- macroglobulin) as well as suppression of plasminogen activator function . In normal fibrinolysis, plasmin degrades the fibrin clot formed in coagulation. The principal inhibitor for these activators is plasminogen activator inhibitor 1 (PAI-1); its combining with activators suppresses fibrinolytic activity. Active tuberculosis (TB) is a disease arising from infection by the Mycobacterium tuberculosis complex which induces a state of chronic inflammation in the infected person . Through inflammatory reactions, the body is able to resist attack from microbial agents, sustain injury and repair damaged tissue. Indeed inflammation often occurs as an immune response triggered by infectious micro-organisms, ischemic damage to tissues and trauma . The vast crosstalk between immune (inflammatory) and haemostatic systems, involves all levels of haemostasis; the endothelium, platelets, clotting and anticoagulant pathways as well as the fibrinolytic system. In conditions of inflammation, there exists an initial and temporary rise in fibrinolytic stimulation mediated by instant sending out of tPA (from endothelial cells). Accompanying this is a delayed yet supported rise in PAI-1 level resulting in substantial decrease in fibrinolytic activity with inadequate removal of fibrin as consequence. Major controllers of PAI- 1 activity include proinflammatory cytokines; they induce the synthesis of PAI-1 in endothelial cells . Reports have shown that inflammation-induced dysfunction of endothelial cells may result in delayed but sustained decreased production of tPA . Since the inflammatory response is mediated by the release of cytokines which have the potential to initiate disturbance of haemostasis including the fibrinolytic system, this study is therefore aimed at assessing the role of cytokines in fibrinolysis in a condition of chronic inflammation such as active tuberculosis. The study location is Calabar, Cross River State, Nigeria. Casecontrol experimental study design (involving TB patients and non-patients of similar age) was employed. Ethical approval was obtained from the Cross River State Ministry of Health and all participants gave their consent. One hundred and twenty (120) male and female tuberculosis patients aged 15-60 years attending clinics at Dr Lawrence Henshaw Memorial Hospital, General Hospital, Ekpo-Abasi and Adazi Health Centres, Calabar were enrolled. Diagnosis of TB was by sputum smear microscopy, chest radiograph or clinical assessment. One hundred and twenty (120) apparently healthy subjects, age and gender matched, with a negative tuberculin skin test (mantoux) in the preceding six months and no history of tuberculosis, selected from residents of Calabar metropolis were recruited as controls. Tuberculosis patients with other disease conditions and subjects who objected to participation in the study were excluded. Fibrinogen concentration (FIB) was measured by Clauss technique  using a Giesse Diagnostics kit (Italy). Fibrinogen/ fibrin degradation product (FDP), interferon gamma (IFN-γ) and interleukin 10 (IL-10) assay was based on sandwich enzyme immunoassay (ELISA) with kits obtained from Cloud-Clone Corporation, USA. The data generated are presented in tables as mean ± standard deviation and in figures. Statistical analysis was by Student’s T-test and one-way ANOVA on statistical package for social sciences (SPSS) version 20 software. Pearson’s correlation was used to express relationship. Significance was set at P ≤ 0.05. Some fibrinolytic parameters and cytokine levels of one hundred and twenty tuberculosis (TB) patients were compared with their control. Table 1 shows that the fibrinogen concentration (349.96 ± 137.75 mg/dl) was observed to be significantly higher (P<0.001) for TB patients versus control and increased above the value obtained for the reference plasma (284 mg/dl). Similarly, fibrin degradation product of TB patients (154.70 ± 52.58 ng/ml) was significantly higher (P<0.001) than the value obtained for control and beyond the detection range (1.56-100 ng/ml). The cytokines interferon gamma (P<0.01) and interleukin 10 (P<0.001) were significantly higher for TB patients when compared to the control, however, the values obtained were within the kits’ detection range. 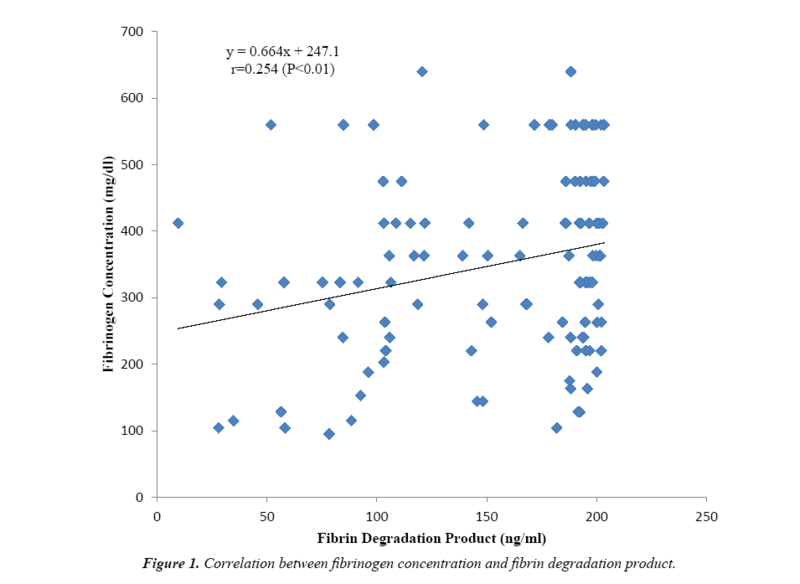 Figure 1 shows positive correlation between fibrinogen concentration and fibrin degradation product (r=0.254; P<0.01). 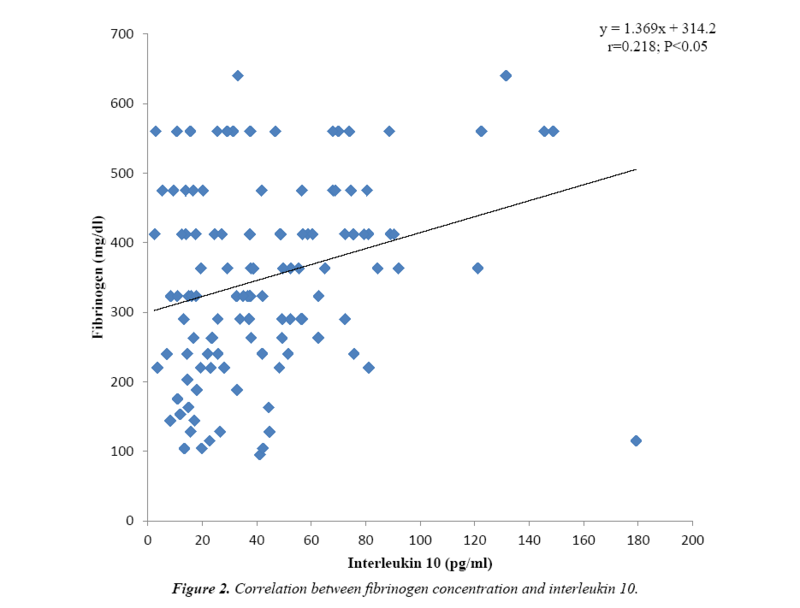 Again a significant positive correlation (r=0.218; P<0.05) exists between fibrinogen concentration and interleukin 10 level as presented in Figure 2. Figure 1: Correlation between fibrinogen concentration and fibrin degradation product. Figure 2: Correlation between fibrinogen concentration and interleukin 10. Table 1.Fibrinolytic parameters and cytokine levels of tuberculosis patients and control subjects. Table 2 shows the effect of duration of antituberculosis therapy on fibrinolytic parameters as well as on interferon-γ and interleukin 10 levels of TB patients. Twenty eight of the TB patients were newly diagnosed and untreated while 50 were in the intensive phase (≤ 2 months) and 42 in the continuation phase (2-6 months) of treatment. The fibrinogen concentration decreased significantly (P<0.001) from 484.39 ± 92.81 mg/dl for new patients through 390.28 ± 90.99 mg/dl for intensive phase to 212.33 ± 76.03 mg/dl for the continuation phase as therapy progressed. Similarly fibrin degradation product decreased significantly (P<0.01) from 181.77 ± 29.54 ng/ml for new patients to 154.16 ± 50.06 ng/ml and 137.29 ± 60.34 ng/ml for intensive and continuation groups respectively. Post hoc analysis revealed that the difference was between the new and intensive groups (P<0.01) as well as between the new and continuation groups (P<0.001). Interferon-γ decreased from 1058.05 ± 630.35 pg/ml for new patients to 927.45 ± 617.44 pg/ ml in intensive group and further decreased to 801.01 ± 489.03 pg/ml in the continuation group; though these differences were not statistically significant. However, interleukin 10 levels decreased significantly (P<0.05) between new patients and the continuation group. Table 2. Fibrinolytic parameters and cytokine levels of tuberculosis patients in different phases of anti-tuberculosis therapy. The fibrinogen concentration of TB patients which was found to be significantly higher (Table 1) versus the control and reference values, could be due to infection-induced inflammatory response in TB which results in the synthesis of large quantities of interferon-γ and other pro-inflammatory cytokines. These cytokines mediate acute-phase reactions where hepatocytes produce acute phase proteins including fibrinogen. Another possible explanation is that there is exaggerated activation of coagulation in a chronic inflammatory state such as tuberculosis, leading to thrombin generation. This would initially lead to excessive clot formation (hypercoagulability) but subsequently platelets and coagulation factors are consumed, a condition known as disseminated intravascular coagulation (DIC). Hence thrombin levels decrease and it is unavailable to clot fibrinogen which leads to the accumulation of the latter. Previous reports support this finding [10-13]. Fibrin degradation product was observed to be significantly increased in TB above the control and reference values implying that in TB condition, normal (primary) fibrinolysis is impaired. This could be attributed to injury to the endothelium by the invading pathogen Mycobacterium tuberculosis. Instead secondary fibrinolysis (DIC) is activated by immediate release of tissue plasminogen activator (tPA) from damaged endothelial cells as suggested previously . Fibrinolytic activity increases, resulting in excess production and accumulation of fibrin degradation products as is the case for TB patients assessed in this study. Indeed, disturbances in fibrinolytic activity have been associated with tuberculosis previously [15,16] and it has been shown that inflammation-induced dysfunction of endothelial cells may result in sustained production of tPA . The observed increase in fibrin degradation product of TB patients correlated positively with increased fibrinogen concentration as shown in Figure 1. A combination of excessive fibrinolysis with increased fibrinogen concentration may pre-dispose these TB patients to a hypercoagulable state with possible clinical consequence such as development of thrombi which could eventually lead to haemorrhage. The interferon-γ level found to be significantly higher for TB patients is probably due to cell-mediated type IV granulomatous hypersensitivity reaction which is an immune reaction meant to protect the infected host but it eventually causes tissue destruction because of persistence of the poorly digestible Mycobacterium tuberculosis antigen. When macrophages present this antigen to CD4+ T lymphocytes, the latter are activated and express the lymphokine interferon-γ. Indeed, a state of chronic infection such as tuberculosis may induce an excessive Th 1 and CD8+ T cell response which is expressed by excess production of IFN-γ. Interferon-γ is a distinct immunoregulatory cytokine involved in the regulation of nearly all phases of immune and inflammatory responses as reported in previous studies [3,17-19]. Thus, interferon-γ is implicated in the inhibition of primary fibrinolysis with subsequent activation of secondary fibrinolysis as seen in active tuberculosis. The production of the pro-inflammatory cytokine interferon-γ is naturally accompanied by the production of the anti-inflammatory cytokine IL-10 which was observed to be significantly higher for TB patients in this study. Interleukin 10 is secreted by T helper 2 cells in order to limit the inflammatory response. This is achieved through inhibition of MHC class II molecules on monocytes and macrophages thereby limiting the production of pro-inflammatory cytokines including IFN-γ. It also acts by suppressing the activity of T helper 1 cells, natural killer cells and macrophages as observed previously [17,19,20]. The significant positive correlation observed between fibrinogen concentration and IL-10 levels of the TB patients (Figure 2) implies that this cytokine contributes to increase in fibrinogen levels and accumulation of fibrinogen translates to excessive fibrinolytic activity as observed in TB-induced inflammation . Thus both interferon-γ and interleukin 10 contribute significantly to increase fibrinolytic activity. Fibrinolytic parameters as well as interferon γ and interleukin 10 levels of untreated TB patients were compared with those in intensive and continuation phases of treatment as shown in Table 2. The fibrinogen concentration decreased significantly as therapy progressed. This is probably because the anti-TB drugs are effective in clearing the offending pathogen hence the acute phase response is suppressed and fibrinogen which is an acute phase protein is no longer produced in large quantities by the liver leading to a decrease in its concentration with therapy. It is also possible that the anti-TB drugs inhibit the binding of thrombin to thrombomodulin  thereby resulting in the availability of thrombin to bind fibrinogen. The fibrin degradation product follows the same trend as it decreases with progress in therapy and implies that the mechanisms of impaired fibrinolysis associated with inflammation are reversed. With anti-TB therapy, there is healing of the endothelium which was damaged by the TB infection. This results in reduced production of plasminogen activator inhibitor (PAI-1) as well as inactivation of thrombin-activatable fibrinolysis inhibitor (TAFI). These inhibitors suppress excessive (secondary) fibrinolytic activity thus normal (primary) fibrinolysis is restored with decreased accumulation of fibrin degradation product as a consequence. The levels of interferon gamma decreased as therapy progressed although this decrease was not statistically significant. However, there was significant decrease in interleukin 10 levels as therapy progressed from the untreated to the intensive and continuation phases of treatment. These findings are supported by previous reports [17,19]. Since IFN-γ was produced to up-regulate the inflammatory response and IL-10 was produced to limit the activity of IFN-γ, it stands to reason that the levels of these cytokines should decrease if the infectious agent (M. tuberculosis) is being cleared by the treatment. As these cytokines have a close relationship with mycobacteria clearance, they as well as fibrinogen and fibrin degradation product, could be used as indices to monitor response to anti-tuberculosis treatment. This study has shown that the cytokines interferon-γ and interleukin 10 contribute significantly to increase fibrinolytic activity as seen in active tuberculosis with haemorrhage as possible sequel. We acknowledge all tuberculosis patients and control subjects who participated in this study as well as the staff at the TB clinics. Funding was provided by the Tertiary Education Trust Fund, Nigeria. Hoffbrand VA, Catovssky D, Tuddenham GDE, et al. Postgraduate Haematology (6th edn). Blackwell Publishing Ltd., UK. 2011. Mehta R, Shapiro AD. Plasminogen deficiency. Haemophilia. 2008;14(6):1261-68. Rijken DC, Lijnen HR. New insights into the molecular mechanisms of the fibrinolytic system. J Thromb Haemost. 2009;7(1):4-13. Turken O, Kunter E, Sezer M, et al. Hemostatic changes in active pulmonary tuberculosis. Int J Tuberc Lung Dis. 2002;6(10):927-32. Porth CM (2004) Essentials of pathophysiology. Lippincot Williams & Wilkins, Philadelphia. 2004;150-56. Arnout J, Hoylaerts MF, Lijnen HR. Haemostasis handbook of experimental pharmacology. 2006.
van der Poll T, de Jonge E, Levi M. Regulatory role of cytokines in disseminated intravascular coagulation. Semin Thromb Haemost. 2011;27(6):639-51. Clauss A. Rapid physiological coagulation method for the determination of fibrinogen. Acta Haematol. 1957;17(4):237-46. Awodu OA, Ajayi IO, Famodu AA. Heamorheological variables in Nigeria pulmonary tuberculosis patients undergoing therapy. Clin Hemorheol Microcirc. 2007;36(4):267-75. Cimmino G, D'Amico C, Vaccaro V, et al. The missing link between atherosclerosis, inflammation and thrombosis: is it tissue factor? Expert Rev Cardiovasc Ther. 2011;9(4):517-23. Margetic S. Inflammation and haemostasis. Biochem Med. 2012;22(1):49-62. Marti-Carvajal A, Salanti G, Cardona AF. Human recombinant activated protein C for severe sepsis. Cochrane Database Syst Rev. 2007:CD004388. Schouten M, Wiersinga WJ, Levi M, et al. Inflammation, endothelium, and coagulation in sepsis. J Leukoc Biol. 2008;83(3):536-45. Akpan PA, Akpotuzor JO, Emeribe AO (2011). Haemorheologic and fibrinolytic activities of pulmonary tuberculosis patients in Calabar, Cross River State, Nigeria. Journal of Medical Laboratory Science. 2011;20(1):27-32. Famodu AA, Ajayi OI, Awodu O, et al. Effect of pulmonary tuberculosis on plasma fibrinogen and fibrinolytic activity. Haematology. 2005;8(3):423-26. Deveci F, Akbulut HH, Turgut T, et al. Changes in serum cytokine levels in active tuberculosis with treatment. Mediators Inflamm. 2005;2005(5):256-62. Lakhani S, Dilly S, Finlayson J. Basic Pathology. 4th ed. Hoddar Arnold, London. 2009. Peresi E. Cytokines and acute-phase serum proteins as markers of inflammatory regression during pulmonary tuberculosis treatment. J Venom Anim Toxins Incl Trop Dis. 2008;14. Mohan M (2010) Textbook of Pathology. 6th edn. Jaypee Brothers Medical Publishers Ltd., India. 2010;130-54. Akira S, Sato S. Toll-like receptors and their signalling mechanisms. Scand Jof Infect Dis. 2003;35(9):555-62.